Feels like we are in a period of intentional stoking of a civil war to avoid a revolution. Pretty creepy and unstable situation. Patriots are ready, willing and able to kick some serious anti-Constitution traitor be-hind should they force the situation and it come to that. What we won't do is tolerate is any FURTHER usurpation of our rights and liberties (including gun rights, free speech, our President, etc). These forces should consider themselves put on notice: Knock. It. Off. Before they bite off waaaaayyyyy more than they can chew... as it stands now, we still have legal remedies to pursuing these egregious and flagrant violations that already exist, but one of our great former POTUS' warned about limiting peaceful recourse and so long as that is available and viable I can see it bearing fruit. ^This is why we don't let popular vote elect Presidents. 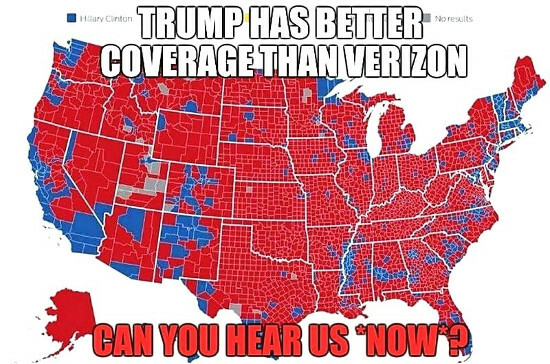 Looking at the map makes it clear that the vast majority of our country went for Trump. The quantity of voters per state is irrelevant by direct count, but is used to determine that State's EC votes. When these left-wing nazis have to make up fake hate crimes time, and time, and time again it shows that "hate crimes are nearly non-existant in this country", and the nazis in the left need to make up fake hate crimes to try to claim "hate still is alive today and is predominant..."
You can't even criticize anything today's real fascist do, if you do you get immediately branded as a "hater, islamophobe, homophobe, a bigot, etc, etc..."
We live in idiocracy today thanks to the far left, and the thing is these "fake crimes" and the attacks against free speech are what will slowly increase hate between the left and the right, and it is what could really start a conflict which no sane mind in this country, or the world, would want. It's almost as if far left-wingers and even many in the left do want hate, they want conflict, they want to oppress anyone who doesn't think like them, and it is becoming mainstream that even the democrat party has been partaking in this "idiocracy" at least since the Obama administration, and probably even before.